Advantages: Easy-to-build and fairly accurate kit of an SU-76M; poly cap fitting makes attachment of the gun after painting a snap; “sag” gauge for the upper track runs to get the right look. As I wrote some years ago, in October 1942 a design team at Factory No. 38 in Kirov, led by M. N. Shchukin and S. A. Ginzberg, developed the SU-12 prospective light self-propelled gun mounting using the components of the T-70M light tank. The vehicle was completed in November, tested in December and adopted for service as the SU-12 but popularly called the SU-76, entering immediate production at that time. This weapon carried the famous dual purpose ZIS-3 field gun which also functioned as an effective antitank gun. The SU-76 had a number of serious problems with its design, first and foremost being the fact it had a closed compartment at the rear which limited both visibility and the ability to service the gun. The gunner had a small cover elevated above the sights for use to observe the battlefield, but overall it was very dark, cramped and difficult to operate. Production ceased in July 1943 after only 560 were built. The vehicle was redesigned by T-70 designer N. A. Astrov in April 1943 and in July 1943 the SU-15 (SU-76M) officially replaced the SU-76 in production (actual replacement on the lines appears to have taken place in May 1943). The cooling louvers on the left side of the roof was removed, the roof eliminated and the back of the sides and rear of the hull cut down for easier use of the gun and servicing by the crew. A much handier design, it proved quite popular in service, and during the war 11,494 guns were built by the Gor’kiy Automotive Plant, Factory No. 38 in Kirov, and Factory No. 40 in Mytishchi. A further 2,238 were built after the war, bringing total production to 13,732. The SU-76s were used in four-gun batteries, three batteries per battalion, and in some cases three battalions to a regiment. Each battalion was issued with a T-70 or T-80 light tank as a command vehicle. During and after the war, these vehicles were freely distributed to allies of the Soviet Union as well as the forces of “struggling national movements” such as the PLA, the KPAF, and the PAVN. 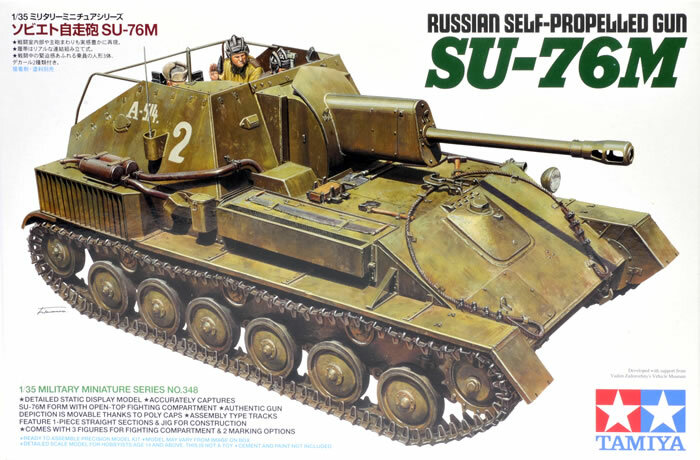 There were two models of the SU-76M built, apparently referred to as either Model 1 or Model 2. The latter had an open casemate but higher sides and a bar across the back for attaching an antiaircraft mount for the vehicle’s DT machine gun. About 15 years ago Alan from Russia came out with a kit of the SU-76M that was later placed in wide release by DML. This kit was something of a dog, as it had probably the thickest and heaviest part ever placed in a small model in a floor plan approximately 6mm (1/4") thick. It was not popular and few modelers wanted to rebuild the kit to get good results. In 2008 Miniart used its new family of T-70 kits to create a much better one of the SU-76M with about 600 parts including a five-man crew. But the kit – while light years ahead of the Alan one – still was a bit of a beast to assemble and some of the T-70 parts were for early T-70s and not suitable for the SU-76M. Now Tamiya has finally gotten into the game with a very nicely done new kit of the little SP gun and it looks to be a typical recent Tamiya effort - easy to assemble and relatively accurate to boot! The kit is very complete and while a Model 1 without the DT machine gun (in this case one of the switchable ones for both tank and ground use) it comes with a PPSh and magazine racks for the drums used by that weapon. It has partially filled shell racks with the rounds fitted with clips for their attachment; this is a far cry from past efforts like the toylike sets of 75mm rounds provided in the M8 HMC kit from nearly 40 years ago. Unlike many previous Tamiya kits, this one uses flat hull assembly parts that must be assembled rather than a single piece belly pan and upper hull. The belly pan consists of six parts, one of which is the casemate front with the gun mount base. The upper hull is another eight parts which according to the directions fit jigsaw style and should be attached in order. Given the fit of most Tamiya kits this seems a good idea and one way to get a nearly seamless assembly. One area of assembly (where Tamiya actually cheated a bit!) is the suspension arms in Step 16; whereas the Miniart ones wobbled about a bit and did not fit precisely where needed, the Tamiya ones have a “cheater” pin to lock them in place. Once the wheels are in place they cannot be seen and as the arms fit very close to the hull this was really a good idea to get a solid suspension for the model. The wheels have both an inner and outer half to give a proper profile and the tracks combine single links with a fixed lower run of about 20 links in one go. Happily Tamiya also provides a “sag gauge” to get the right sag for the upper track run and shows how to use it with 34 links making up the upper run. As the suspension is fully fixed with no variables or adjustable parts it should make a neat run if done per the instructions. The muffler ends will need to be drilled out with care as they are quite small in diameter. Note that there is no etched brass which would have been useful for the radiator grill on the upper outside of part B10. The big radiator air exhaust louver on the right rear is quite clever; Tamiya molded it at an angle so all of the blades in the louver are represented and once the top is attached they have a lot of depth and definition. Kudos for a very smart molding ploy. The gun has a positionable breechblock and a trapped poly cap fastener inside it to permit elevation. This is a good idea as it provides better friction than styrene on styrene usually does. The gun in this kit looks to be easier to assemble than the one in the Miniart kit (36 parts as opposed to 55). While the gun does just pop into place (Miniart’s had a pin installed from the bottom which complicated final assembly) there is a three-piece top section which must be installed after the gun is fitted. The model includes a sprue with three figures, a gun commander, gunner and loader (the driver is not visible if the hatch is closed, and as such is not provided). These are the recent figures from Tamiya and are not bad, with the commander in a greatcoat with shapka fir cap and the other figures are in winter quilted uniform with tanker’s helmets without earphones. As many have noted, the commander’s head is that of Vladimir Putin - guess Tamiya wanted to see if he could take a joke! When finished the gun may be traversed and elevated and the driver’s hatch and rear door may be positioned opened or closed; note that there is no interior in the driver’s compartment so if you want one you will have to scratchbuild it. The model also is not set up for opening the engine bay. Finishing directions are included for two/three vehicles, both in Soviet 4BO dark green: 11th Guards Self-Propelled Artillery Battalion, East Prussia 1944 (chassis number 410144, white A-514, piece number 2); Unknown self-propelled artillery battalion, Karlshorst District, Berlin 1945 (white 27 or white 30). Considering the number of vehicles used and by how many users this is a bit stingy! In summary, this kit is superbly molded and designed for easy assembly, and superdetail fans (other than engine bay fans) will have a ball with the kit as it comes.